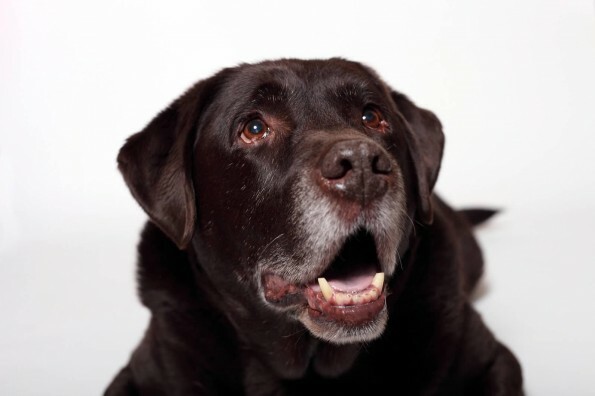 This is the story of one of our favorite seniors, Frodo written by his mom. Thank you Luana for sharing his “tail”. Frodo is my 13+ year old pure bred Chocolate Labrador Retriever. He is a loving, wonderful, gentle old soul whose registered name is Jaunenoir’s Frodo Baggins, after the dear character in the Tolkien books. Frodo has survived 2 bouts of cancer and a case of Lyme disease, and is still sparky and as happy as ever today. When Frodo was 8, Dr. Downer found a small lump on his back leg, the size of a grape, above his left foot, during an examination for a torn toenail. 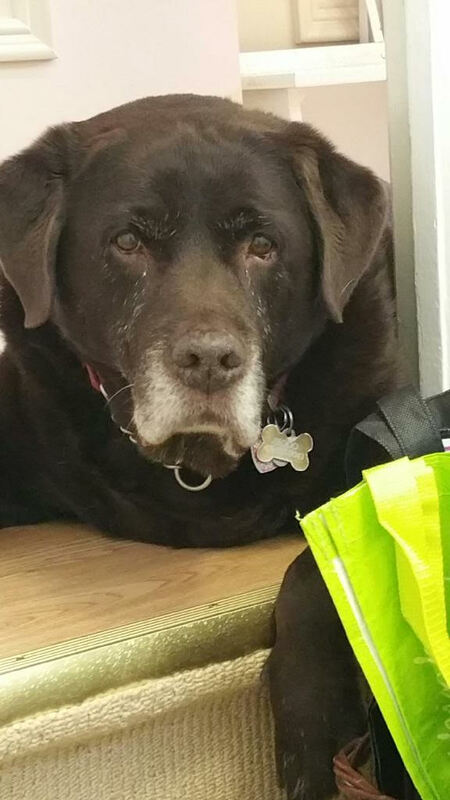 Since Frodo had a number of “fatty deposits” starting to accumulate on his body, as Labs do as they age, we decided to have this one tested, as well as several others on his body. The back leg lump came back as a mast cell tumor, which is histamine based cancer tumor. We scheduled surgery without a second thought and Dr. Morris removed the lump on the leg, as well as two other tiny lumps on his right side. The back leg lump came back as Grade 1, and they were able to remove it with clean margins, so no further treatment was needed and Frodo recovered well and returned to his normal self in no time, after a month of rest and TLC. When Frodo was 11 (and after 3 healthy years), I found a small raised red lump on his right ear, just near the base where it attached to his head. It was painful to the touch for Frodo. Dr. Lyons had the lump tested, and it came back as another mast cell tumor. While the lump was small, because of its location on the ear lap and so close to his head, she suggested we see a canine oncologist to explore options for removal. We saw the oncologist, and they recommended removing the entire ear flap and surrounding area. We were unsure whether to proceed with surgery, given Frodo’s age (his health was otherwise great). We had to weigh the risk of the lump growing rapidly and being itchy and painful, as mast cell tumors can do and potentially spreading internally, reducing not only his remaining lifespan, but the quality of those remaining months or years, with the risks and costs associated with surgery, and potential chemotherapy. 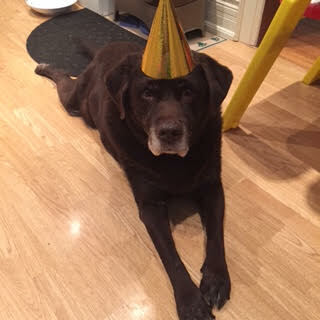 It was a difficult decision, given that Lab’s generally live to an average age of around 12 years old. We decided to proceed with the surgery, in order to prevent Frodo from having to live his remaining days with a potentially painful and growing tumor on his head, but we opted for no chemotherapy afterwards, regardless of the what grade the tumor came back as. The surgery was the most intervention we would do for him at his advanced age, and we chose to do it in order to maximize his comfort in his final year(s). We also requested that the margins be the minimum size, in order to save as much of the ear flap as possible. I remember weeping as I handed his leash off to the vet staff at the clinic, while Frodo was looking at me saying “What’s up mom, I feel fine, where am I going? Why are you sad? What now? “. To make things worse, this all happened in the week before Christmas. We scheduled the surgery for January 6th, and just prior to it, we had a photographer friend take pictures of Frodo so we could remember his beautiful head and soft velvety Lab ears before the right one got partially removed. We had no idea what he would look like after surgery, and there was always a risk they would open him up and make a decision to remove the whole ear flap or potentially more of his head and face. The surgeon did an amazing job – Frodo came out with only a small portion of his ear flap missing! Once the hair grew in, you could hardly even notice!!! It far surpassed our expectations! The tumor did get graded a high Grade 2, so while they recommended chemotherapy, we declined and took Frodo home and gave him lots of love, and treats, and hoped for the best. It has been almost 2 years now and Frodo is happy and as healthy as he can be at 13. He is a little/lot heavier and slower, and sleeps a lot, but still goes out with his dogwalker every day. He has many friends at the High Park off leash area. He still perks up and investigates the sound of anything that might resemble food or treats being opened. And he will always sneak in a big wet kiss any chance he can get! He has a lot of real estate on our main floor (2 orthopedic dog beds) since he doesn’t climb our stairs anymore, and his daily supplement regime of vitamins, fish powders and oils, etc. keeps us busy. I think the fresh salmon skin we give him every week is extending his life! We love him to bits and every day with him is a blessing.